Sometimes when you’re going out for dinner you don’t just want a good meal to fill your belly, sometimes it’s about trying new things and turning it into an experience. 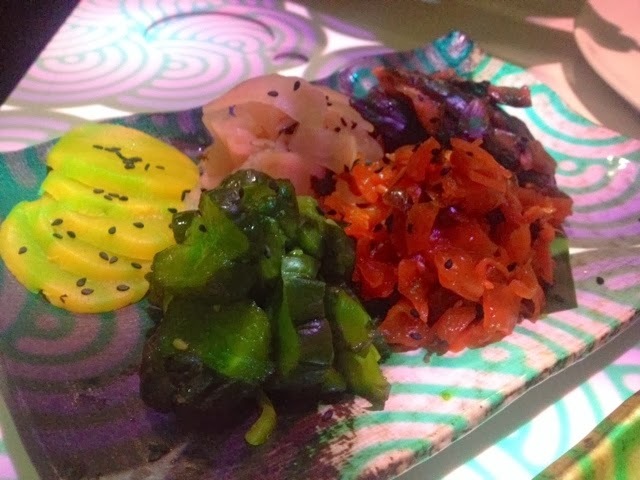 A dining experience is precisely what you get at Inamo. The Boyfriend and I decided to go Japanese for our date night a few weeks ago and since neither of us know too much about Japanese cuisine, Inamo with it’s varied menu and sharing/tasting style menu seemed like a good option for us, although technically this is ‘oriental fusion’ not just Japanese. By far the most stand out feature of the dining experience at Inamo is the interactive table/menu/entertainment system… whatever you wish to call it. 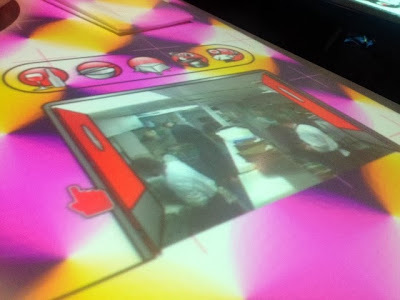 Each seat has a small touch pad which is used to navigate your way through the system which is projected onto your table. Not only can you browse the menu in this manner, but the dishes are projected onto your plate as you browse, you can choose the background of your table from a vast selection of images and patterns and extras include games, maps, transport information as well as a webcam into the kitchens. There is so much to do that you needn’t even bother talking to your dining companion. There was a period of probably a good five minutes where The Boyfriend and I didn’t exchange a word before we realised we were totally ignoring each other to play with the table. If you’re a techno geek or simply enjoy a new experience, you’ll love it. For the technology shy among you though, it’s easy to navigate and there’s an option to call the staff over for service. Eventually getting over the excitement of the interactive menu, we got around to ordering ourselves a couple of non alcoholic cocktails from the soft drinks menu. These were really tasty, much more exciting than your average soft drink and great alternative to the alcoholic options if you’re trying to be good. I went for the Tropical storm which was a blend of passion fruit, lime and guava with a hint of cinnamon and very refreshing indeed. 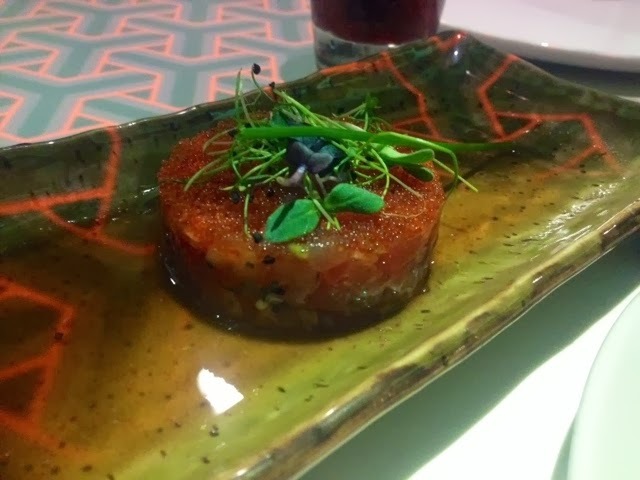 For our small plates I chose the tuna tartar which was my favourite dish of the evening: an interesting blend of both textures and flavours and definitely something a bit different. 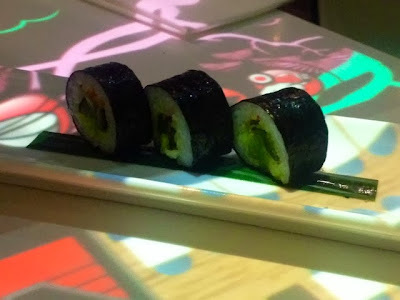 The Boyfriend’s vegetable uramaki were also really tasty, crunchy and much better than other versions I’ve had of it. For the large dishes The Boyfriend ordered the black cod, which isn’t actually such a large dish, but oriental cuisine doesn’t really tend to be. He also thought it was amazing so the size clearly didn’t bother him and we shared his side dish of tsukemono (a selection of pickled vegetables) because there was such a large helping and they were seriously tasty. The gherkins and tomatoes were my particular favourites. 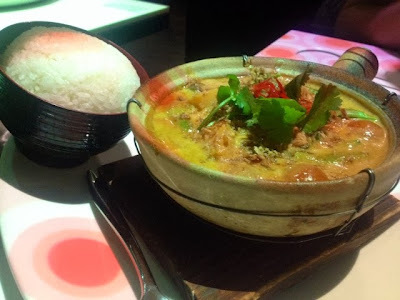 I ordered the Thai red curry and to be honest I’m a little disappointed with myself for going for a safe option. It was a Thai curry, it was nice, but it was just a Thai curry, I’ve had it many times before and this one was good but in no way stood out to me. To be honest, reflecting on the menu, this sort of thing is put on there as the easy option for people who are unadventurous or don’t understand all the dishes. My pretty average experience of the larger dishes is entirely my own fault for ordering something familiar. 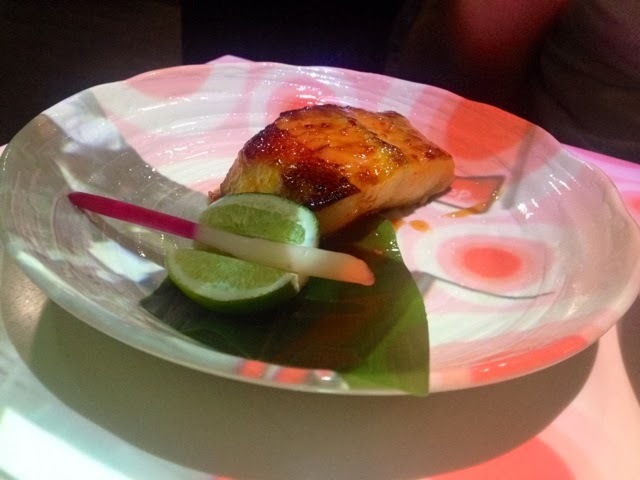 A woman on the table next to us had the hot stone rib eye which looked and smelled nothing short of spectacular and I should have had that, or Inamo‘s take on duck with pancakes which I glimpsed on another table and also looked really good. Oh well, lesson learned, be more adventurous and order the items from the menu where you don’t know what to expect to arrive at your table. It’s not as if I’m fussy, chances are I’ll love it. What I did like about this curry was the nice and unusual variety of vegetables, butternut squash being the main bulk of the dish, but the oriental mushrooms were lovely. I was expecting it to be a bit hotter though, this was quite mild. 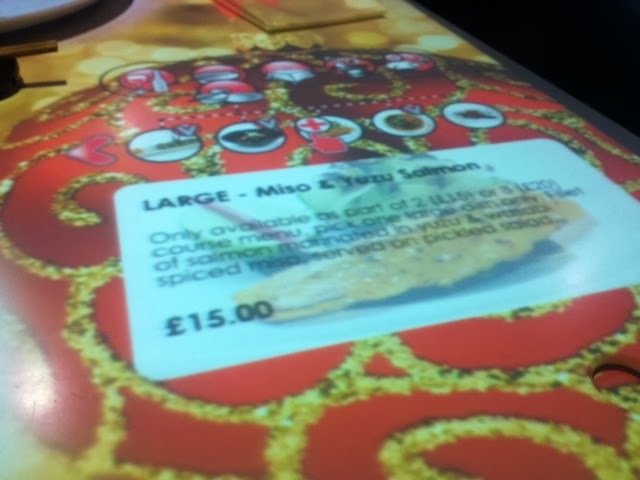 Inamo isn’t the cheapest of restaurants but at around £30 a head it also is by no means the priciest among its Soho neighbours. If you don’t make the mistake I did and you order exciting new things and fully embrace the unfamiliar then the price is totally worth it for the experience and trying new flavours.